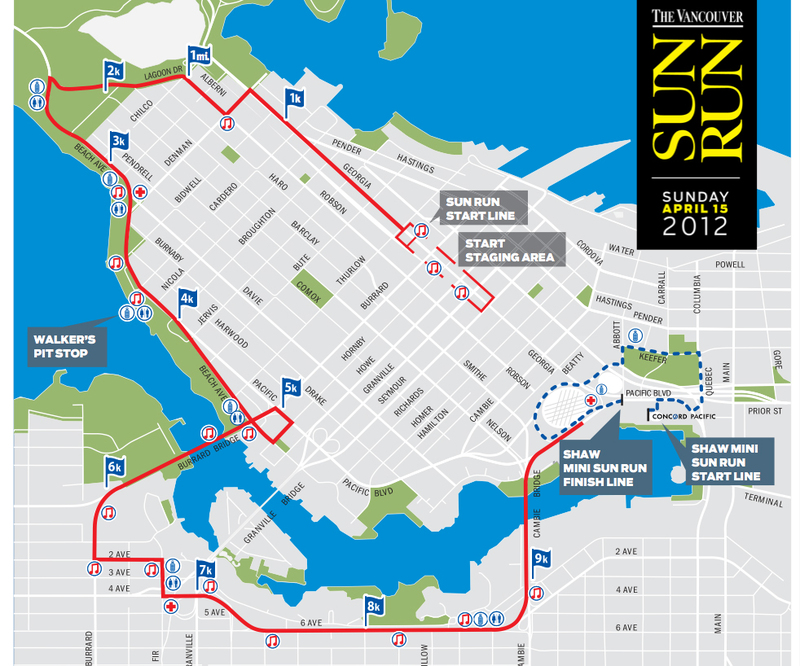 In the past four days I have run 102K and am looking forward to a mini-taper in the next three days to rest up for the Vancouver Sun Run, the largest 10K in the world with 60,000 runners registered for the 2011 edition. On Sunday, I ran 35K, followed on Monday by an easy 10K at recovery pace in the morning and another 7K in the afternoon. Tuesday called for a VO2max session. I ran 11.5K from home to the dirt/gravel track on the other side of Squamish. There I did 6 X 1200 metre repeats, i.e. 6 X 3 laps around the track, at 5K race pace. I jogged an easy lap, 400m, between each interval. I was pleased to run the 1200s in 4:40, 4:38, 4:37, 4:33. 4:38 and 4:35 on tired legs. Rest was between 2:23 and 3:33. While not quite the 4:30 I was supposed to do, I didn't want to dig super-deep as I preferred to save that mental strength for Sunday's 10K race. Tim picked me up from the track and we went for a walk with Luka on the nearby trails, a perfect cooldown from this 21K session in the late afternoon. These types of intense workouts always scare me a little, but completing them is very satisfying. The next morning I walked Luka for half an hour, a good warm-up, before heading out for a 24K run. It was cooler than the previous afternoon, which was nice. My legs felt light and energetic. I covered the first 12K in 62:10, with a couple of stops to take a sip of the dark-brown Hammer Gel espresso & water mixture without spilling it all over my white shirt. My average heart rate was 135. Heading back home, I picked up my pace and ran the next 10.14K in 48:54, or an average of 4:49 per K at 136bpm. This section included a stop as I ran into two female runners in their 60s who warned me about the bear they had just crossed paths with. Since I felt good, I decided to maintain effort on a 1.3K section 'back up the hill' to Valleycliffe, taking 6:32 at 155 bpm, before slowing to cool down in the final 500m. Overall, I ran 5:01 for the 24K at an average heart rate of 136bpm. 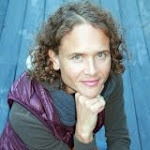 In the evening, Tim, Luka and I went for a 5K jog around the block to round up my four-day mileage to 102K. In the next three days, I'll run between 31 and 37K (depending on whether I'll do a double run today as planned, or choose to do only one session) to recover for the Vancouver Sun Run on Sunday. My plan is to improve my four-year-old 10K personal best, which is 39:51. I ran this 10K last year for the first time; I clocked 40:09 on my watch, and I'd like to think I can go quicker this weekend. 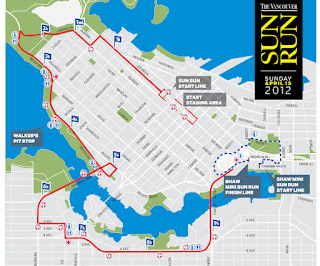 I am very much looking forward to racing the Vancouver Sun Run as hard as I can.